Servers don’t make a livable wage unless their customers leave a tip. While many would argue that it should be the restaurant’s responsibility to pay their waiters and waitresses more money and not put the burden of responsibility on the customer, this is the way things are right now in the American restaurant industry. And it really isn’t too fair. If a waiter does a great job and services the customer well, the customer can still choose not to leave a fair tip. That means the server might not eat dinner sometime that week. In Los Angeles, a waiter served a group of teens as they were headed to their homecoming dance. The waiter remembered his experience as a young high school student looking forward to his homecoming dance. 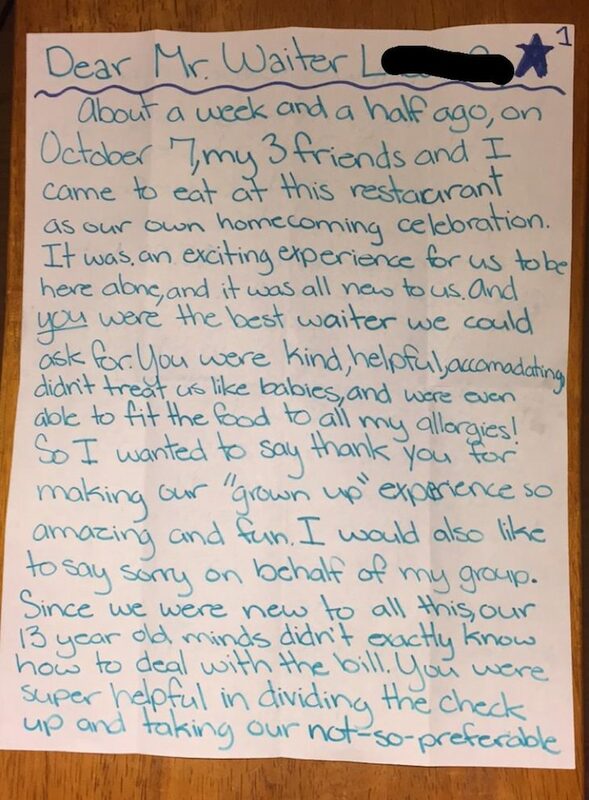 So he made sure the teens had a pleasant experience at the restaurant. The waiter made sure of it. But they left him a despicable tip. After serving all the teens and doing a great job, they left him only $3.28. That is hardly enough to buy a drink at Starbucks, let alone pay the bills that were mounting. The waiter went home. And he felt hatred for the students who did not know the value of hard work. They were entitled and looked down on people like him. Or so he assumed. After several days, the waiter forgot the slight. His life went on as normal. But ten days later, he received a letter from the teens. “About a week and a half ago, on October 7, my three friends and I came to eat at this restaurant as our own homecoming celebration. It was an exciting experience for us to be here alone, and it was all new to us. And you were the best waiter we could ask for. You were kind, helpful, accommodating, didn’t treat us like babies, and were even able to fit the food to all my allergies. So I wanted to say thank you for making our ‘grown-up’ experience so amazing and fun. “I would also like to say sorry on behalf of my group. Since we were new to all of this, our 13-year-old minds didn’t exactly know how to deal with the bill. You were super helpful in dividing the checkup and taking our not-so-preferable cash. 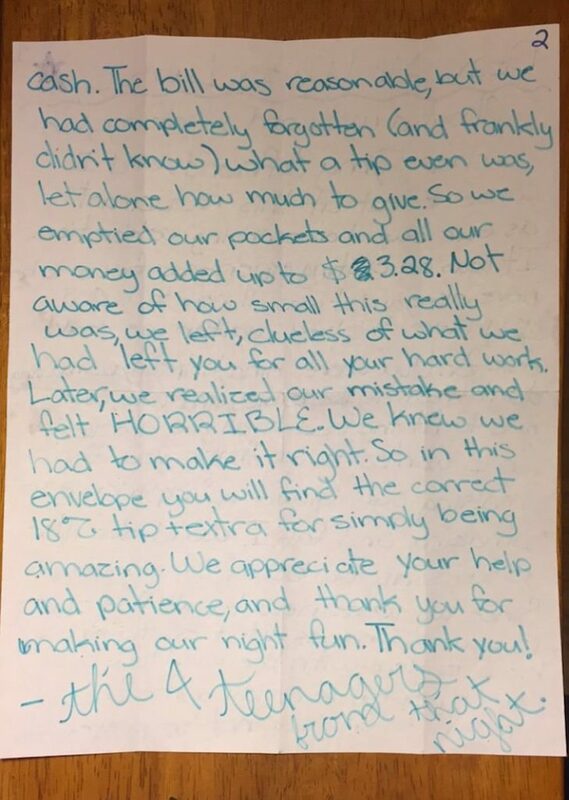 The bill was reasonable, but we had completely forgotten (and frankly didn’t know) what a tip even was, let alone how much to give. So we emptied our pockets, and all our money added up to $3. 28. “Not aware of how small this really was, we left, clueless of what we had left you for all your hard work. Later, we realized our mistake and felt horrible. We knew we had to make it right. Not only did these teens admit their mistake, but they also made it right. What do you think about this apology?